The CPX HTM standard AVSU Module is used in conjunction with and by configuring Precision UK’s Area Valve Service Units (AVSU) for one to six gases services, depending on the hospital area served. 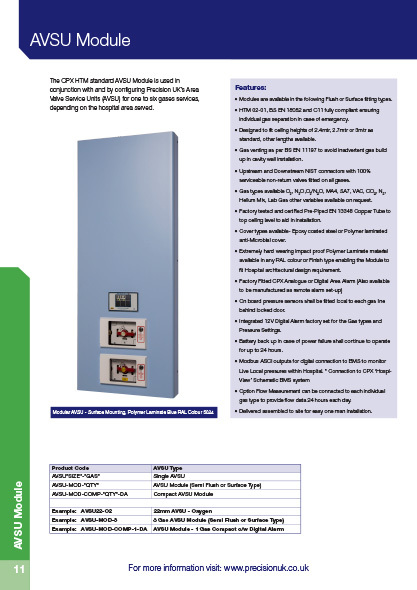 Modules are available in the following Flush or Surface fitting types. HTM 02-01, BS EN 18082 and C11 fully compliant ensuring individual gas separation in case of emergency. Designed to fit ceiling heights of 2.4mtr, 2.7mtr or 3mtr as standard, other lengths available. Gas venting as per BS EN 11197 to avoid inadvertent gas build up in cavity wall installation. Upstream and Downstream NIST connectors with 100% serviceable non-return valves fitted on all gases. Gas types available O2, N2O,O2/N2O, MA4, SA7, VAC, CO2, N2, Helium Mix, Lab Gas other variables available on request. Factory tested and certified Pre-Piped EN 13348 Copper Tube to top ceiling level to aid in installation. Cover types available- Epoxy coated steel or Polymer laminated anti-Microbial cover. Extremely hard wearing impact proof Polymer Laminate material available in any RAL colour or Finish type enabling the Module to fit Hospital architectural design requirement. On board pressure sensors shall be fitted local to each gas line behind locked door.Integrated 12V Digital Alarm factory set for the Gas types and Pressure Settings. Battery back up in case of power failure shall continue to operate for up to 24 hours. Delivered assembled to site for easy one man installation.